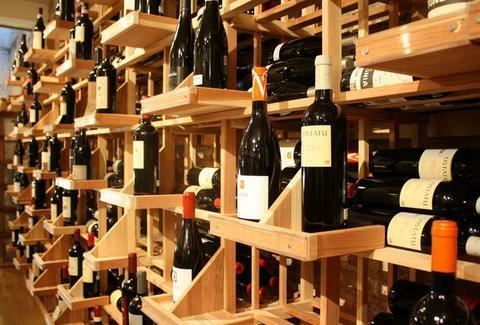 If you had a nickel for every great bottle of wine you enjoyed at a wine bar but were unable to find afterward, you could afford to drink in a wine bar. Bringing them out of the cellar and onto the shelves: Cork Market, opening today. Market's a handsome, brick walled galley lined with light-wood racks hawking bottles of the same great Euro wines served at Cork wine bar, and tagged with identical bin numbers, making it easy to find that bottle you drank at dinner, even if you can't find that car you drove to dinner. If you're hoping to branch out, they've also got a selection of New World wines not offered at the bar (from Oregon's Roots Pinot Noir, to upstate NY's Hermann Wiemer Riesling); or, if you're feeling a sudsy, a selection of wondrous beers, like Lagunitas Pils, Virginia's own Holy Brew, and Speakeasy's "Big Daddy IPA", which Adam Sandler teaches toddlers to gleefully splatter onto walls. To round out the wine-bar-in-my-apartment experience, there are cheeses and charcuterie (like Fra'Mini prosciutto/salami), plus light bites from pesto and salsa verde dip to couscous and Tuna Nicoise, which, being at home, you're free to follow up with a Baconators...and most of another Baconator. Some day. To help you keep track of your ever-expanding taste, Cork's computer will track and store all your vino purchases, a mounting bill that'll have you back at home, scouring your couch for nickels.